My Mistress is a fertile and leafy oasis. Author image. My Mistress. She's a saucy little number, with a banging fit out, a cheeky sense of humour, and no shortage of means by which to gratify. 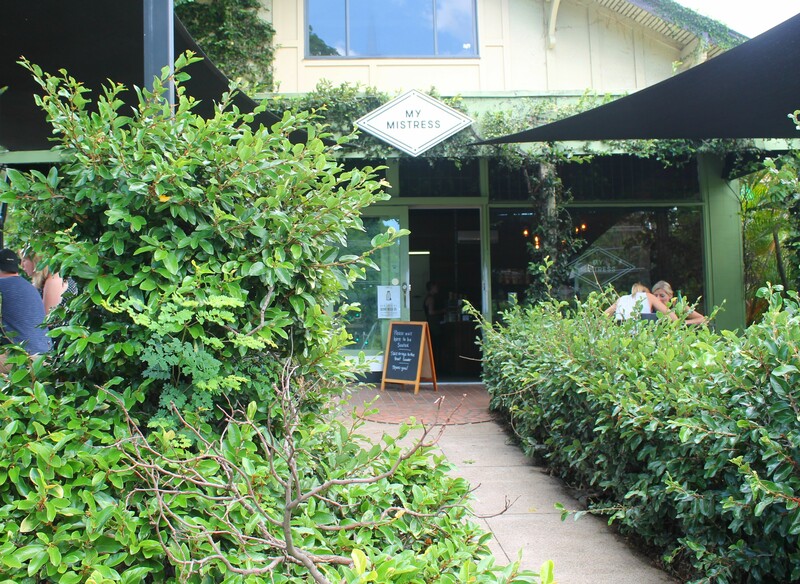 I fell for her the minute I spotted her from Clayfield's busy Sandgate Road - all creeping vines, lush foliage, and shaded outdoor (and cosy indoor) tables. I was hungry and craving coffee. Fortunately, she was willing to satisfy all demands. Okonomiyaki, Mistress style. Author image. My Mistress has been open a couple of years now, and word has gotten around. She's good. She's popular. So much so that you might have to wait for a table. If so, cool your heels. Enjoy spending some extra time in this leafy green oasis. Pretend you're on a tropical island. Pretend you're on honeymoon. You won't be disappointed. 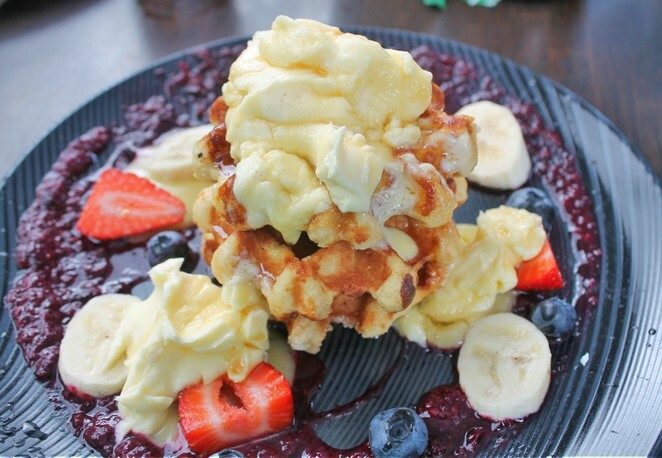 Waffles with lemon curd, berry coulis and mascarpone. Author image. The cafe's naughty-but-nice theme continues on the menu, where items are grouped by Cheeky Fling, Main Affair and On the Side. 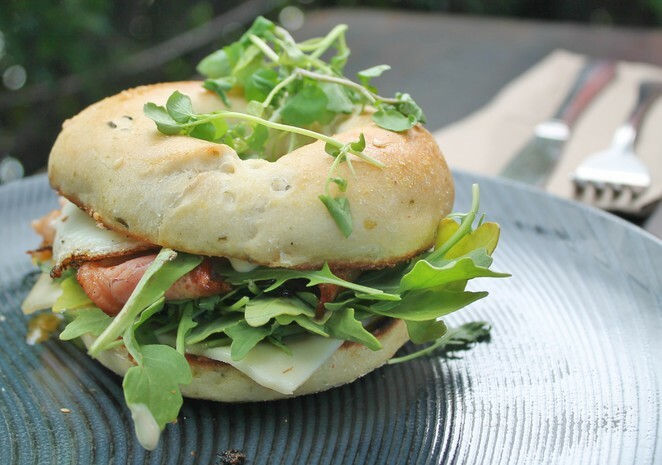 Individual meals include Rendezvous (smashed avocado on sourdough with house-made labneh, lemon infused olive oil, seasonal tomatoes and dukkah) and Morning Glory (smoked bacon with free-range fried egg, rocket, Swiss cheese, tomato relish and aioli on a toasted bagel). 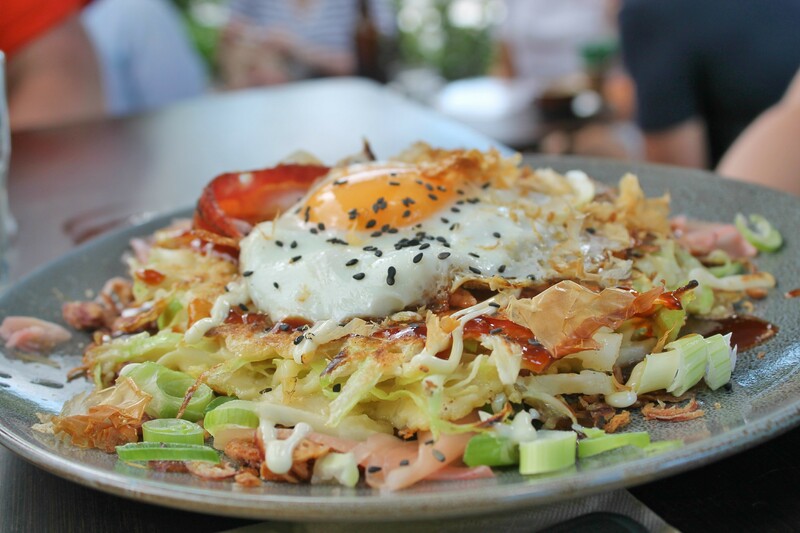 Then, for those with more exotic tastes, there's Oh My Geisha, which offers a Japanese style cabbage pancake with bacon, fried egg, kewpie mayo, house made otafuku sauce, nori, pickled ginger, dried shallots, chilli and bonito flakes. 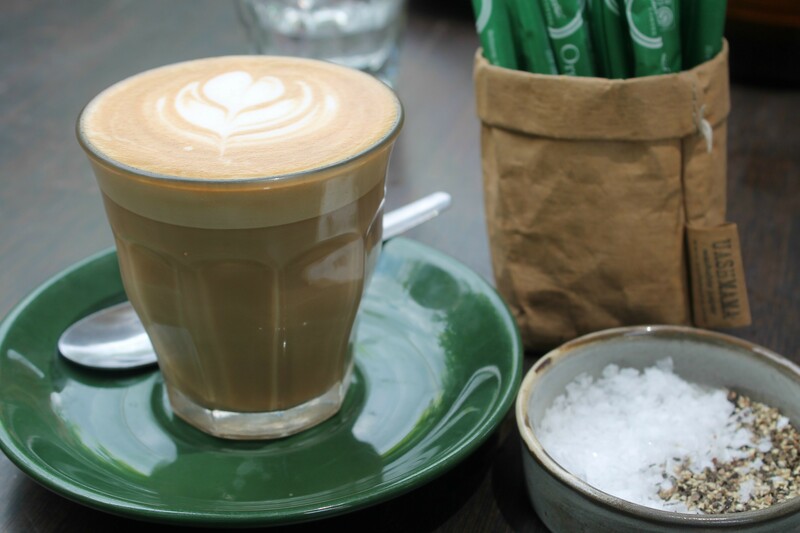 Latte for lovers. Author image. However, my sweet tooth sought its match in the menu's Sweet Thang - baked waffles with house-made lemon curd and mixed berry coulis, topped with lush, creamy mascarpone to balance out the tang. 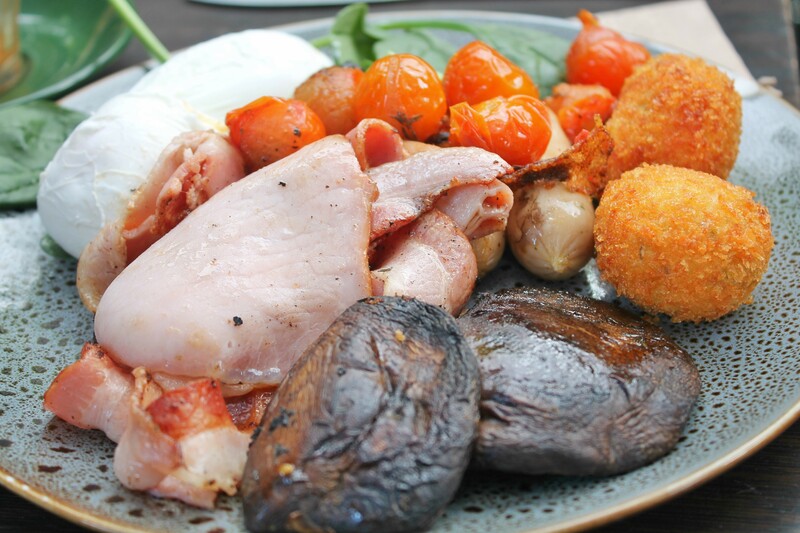 Our table also sought to consort with the Head Mistress - house-made potato and feta hash balls, with poached eggs, pork chipolatas, smoked bacon, blistered cherry tomato and roasted field mushrooms. Pop the cherry tomatoes. Author image. My Mistress also brews great Genovese coffee and serves mouth-watering cold-pressed juices and freshly made smoothies. These include the green smoothie (kale, spinach, apple, mint, pineapple and ginger) and the protein smoothie (peanut butter, banana, spinach, strawberries, oats, maca powder, wheatgerm, and cacao nibs). 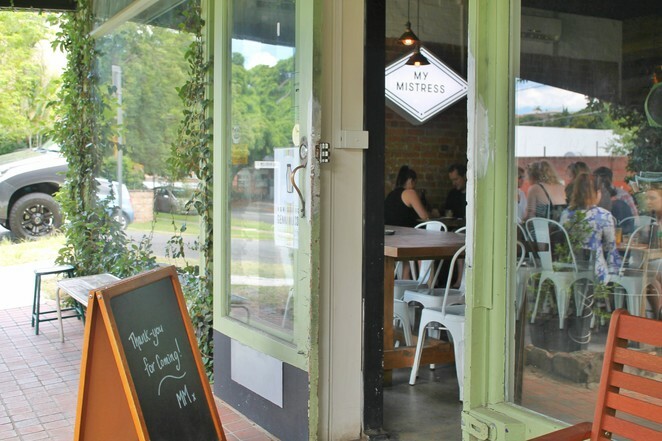 My Mistress offers ample street parking and, with bowls of water left outside for precious pooches, is dog-friendly too. What isn't left to love about her? Open wide, come inside. Author image. Damsel - thanks for letting us know about this place. I have just added it to my to do list. Yum Damsel those food shots are mouth watering, well done!